Design your home office or living room around this stunning Ameriwood Home wade wood veneer Bookcase. The wade Bookcase is finished in a Rustic Gray wood veneer glaze with a hand painted metal frame. The wade pairs industrial and rustic style together for the perfect combination. Keep all your books, magazines, collectibles and Seasonal décor on display with the Bookcase. 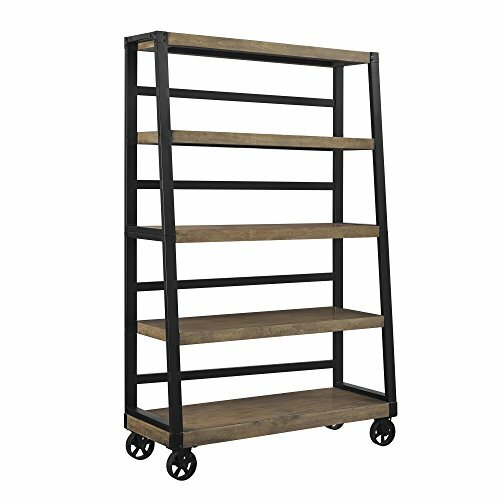 Four rolling casters allow you to move this Bookcase throughout your home or lock the wheels in place and keep your Bookcase stationary. Ameriwood Home wade wood veneer Bookcase requires assembly upon delivery. This tall media cabinet with doors and shelves is great for DVD Storage and serves as Office Furniture as well. Put this media tower along side an entertainment center for hidden media storage and a beautiful home decor.